I really don’t cook much. (This is Larry, Aggie’s husband, by the way.) And when I say I don’t cook much, I should probably say I never really ever cook. Sure, I can bust out some fried egg and cheese sandwiches with the best of them, and “Daddy’s Pasta” made with only the finest butter, salt, and pepper is one of our kids’ favorite meals (or at least top 5). But when it comes down to it, I sadly have to admit that Aggie does pretty much 99% of the cooking in our house. So when Aggie asked me if I ever wanted to be a guest blogger on aggieskitchen.com, I said “Oh yeah definitely”. Pretty much the same “Oh yeah definitely” response she usually gets when she asks if I have plans on cleaning the garage anytime soon. Needless to say, I wasn’t really sure what I was planning on cooking, or blogging about. So a few weeks went by, and my guest blogging gig was falling lower and lower on my “to do” list. But then it hit me. I saw the finale of “The Next Food Network Star”, and my mouth was absolutely watering over Jeffrey Saad’s Harissa Steak Sandwich. I told my wife “THAT IS WHAT I AM GOING TO DO FOR YOUR BLOG!! !”, with the same enthusiasm that our four-year son exclaimed to us when he first decided he is going to be a professional basketball player when he grows up. So now I had to just follow through. I wasn’t going to let myself down. I was going to step up to the challenge, and prove all the naysayers wrong. Okay, so there really weren’t any naysayers, but come on!! I want you to feel my excitement here!! I found Jeffrey’s recipe here. The next step was actually finding Harissa paste. For those who didn’t watch the finale, you may be asking what is Harissa? Harissa is a North African hot red sauce or paste whose main ingredients are chili peppers (often smoked or dried) and garlic. Though most closely associated with Morocco, Tunisia, and Algeria, it is a standard ingredient of North African cuisine. So I called around to a few different local specialty markets in my area, with no luck. But low and behold, I ended up finding it at Petty’s Meat Market in Longwood, FL, on Friday. (who also by the way sells the most incredible Bourbon Pecan pies). I also purchased the NY Strip Steak from Petty’s. Petty’s ROCKS!! Also, the recipe calls for sandwich rolls or bread of your choice. I went with Cuban bread. Not because I meant to. I meant to pick up French bread, but picked up Cuban bread by accident. 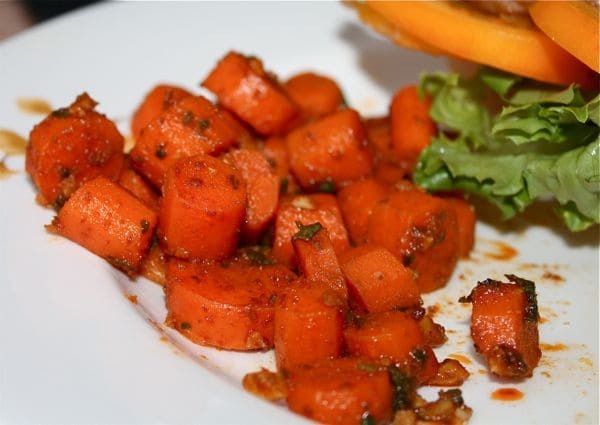 So now I needed a side dish, so I did what any other amateur cook would do who was cooking a North African steak sandwich, I googled North African side dishes, and found the recipe of North African Spiced Carrots. So here I was early Saturday evening. I had my ingredients lined up, I had Harissa paste, I had my steak, I had my carrots, I was ready to do this!!! I really wanted to show Aggie I could do this myself, but I pathetically had to admit I never peeled a carrot. Honestly, I didn’t even know I was supposed to peel carrots. So, Aggie peeled one for me and I was on my way. UH OH!! Another roadblock. I never minced garlic before. So Aggie showed me how to smash the garlic clove with a knife then peel the rest until the middle comes out. At this point, I am looking at my wife like she is a freaking culinary genius. So this went on for a little bit. How do you not bruise mint? What’s the best way to squeeze a lemon to get lemon juice? How do you rehydrate sun-dried tomatoes? So after all of the tutorials from Aggie, I was on my way. Aggie went outside to the pool with the kids, and I was ready to roll solo. I was pretty excited. I had picked up a couple six packs of Gordon Biersch beer. I had some 90s R&B music blasting on the Pandora machine. I even was wearing my 3W1M shirt for the extra power and internal agility. So then an awful thing happened. My A.D.D. kicked in. 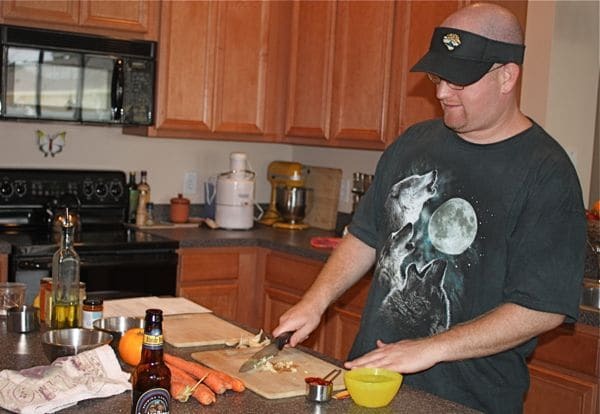 While I was peeling the carrots, I looked at all of the ingredients, then I Iooked at the recipes, then looked at the Harissa paste, then I turned the music lower, then went back to peeling carrots, then I looked back at the recipes and I wasn’t sure what to do first, then I went and got another beer, and then I turned the music up louder. Then finally after a couple hours, the meal was complete. And I have to admit, I did a bang up job. The steak sandwich was probably even better than it looked on TV. 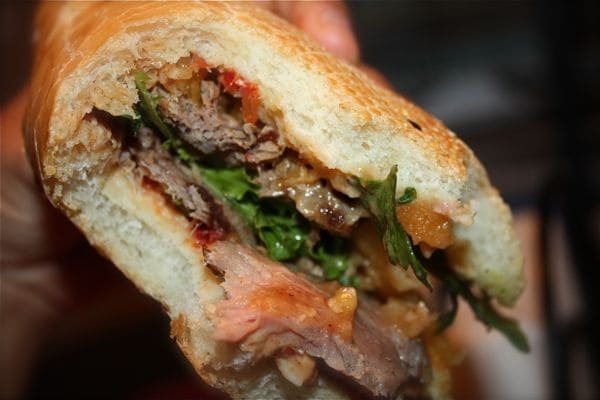 The Cuban bread perfectly soaked up the juice from the steak, and tasted great with the Harissa mayo. The carrots were very tasty and had lots of sweet heat. So in summary, Jeffrey didn’t win. (which made me very Saad). LOL. But one thing he did do was get ‘ol Larry more involved in the kitchen. I hope they give him a show on the Food Network, because I’ll totally tune in. I think I may give this guest blogging thing another whirl. I had a lot of fun last night, and the best part of it all?? Aggie loved it! She was so proud of me and was so happy, and that made me very happy. As for my son?? I think the Orlando Magic may still need a back-up Point Guard. Never say never! If you want to make this awesome sandwich, and side dish for yourself, you can find the recipes here and here. can we get you to come over and teach my hubby how to make this or even 'daddy's pasta' would make me happy as this wife would love to have someone cook for her once in a while. We are laughing so hard we are crying. That was the funniest post and I give you alot of credit for making that steak sandwich. I don't remember you ever cooking anything growing up, so I'm impressed. I'm proud of you little brother! I'm sure Aggie appreciated you cooking. Did you take the pictures too or leave that up to Aggie? Another food blogger is born! Great post, Larry! I actually saw Harissa at the store the other day and it reminded me of that ep of the Next Food Network Star. Good job Larry. I admire you for having the guts to tackle the cooking gig. You did a great job on Jeffery's harissa sandwich. Aggie is lucky to have you. My hubby has blogged for me once too. You made me laugh! Looks great! I hope they give Jeffery a show too because I really like him. WOW – you cook pretty darn well for not cooking. What a great looking meal. Jeffrey did have some fantastic meal ideas. Nice work Larry! Great post, Larry! I'm sure I could never get my boyfriend to write a post even if I was able to get him to cook something! This sandwich looks great! So happy you were inspired to get into the kitchen and to write a post for Aggie! Nice job Larry! The hubster read this post also and we were both laughing because some of the same things go on at our house. Great post! Maybe I can get my husband into the kitchen via guest blogging, too. Great job, Larry! So funny. 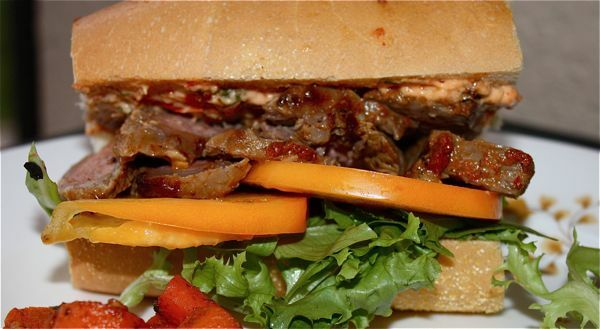 I have Aggie's blog linked to mine, so when I saw "Harissa Steak Sandwich," I immediately thought "Next Food Network Star." That's cool that they put Jeffrey's recipe up. You should let Food Network know. Now I want to make this sandwich. Hey, I just put a comment on Jeff's website to tell him to come on over to Aggie's Kitchen. Hey, I saw that episode! I think that we'd like to see a video of you preparing this sandwich! 🙂 I'm so impressed that you tracked down the ingredients and tackled this amazing sammie! Well done! YUM! PS: This was such a fun post! Great job Larry – looks delish! What a great post! Totally had me laughing. 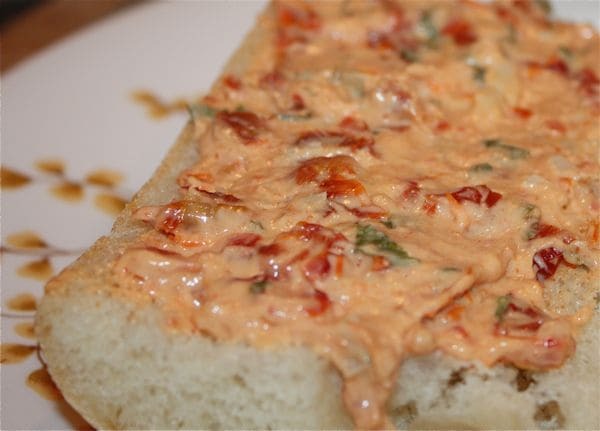 The harissa paste sounds really good to me and the sammie looks amazing! Great job!! My mouth started watering right away. I will have to give these a try soon. That is one mighty sandwich! What a great sandwich. You did a terrific job. The best part about this blog post is the 3W1M shirt. Perhaps I should convert mine to an apron. Hmmm..I feel a craft project coming on. Thanks for the linky love, Larry. Way to go Larry. My husband would never watch the Food Network let alone prepare an entire meal. You're a natural! 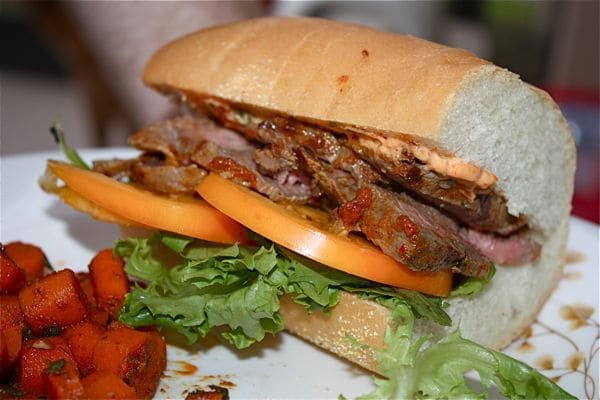 That is one tasty looking steak sandwich! What a delicious looking sandwich. Excellent job! Looks delicious! I recently made some dishes from Melissa d'Araian's show and they tasted fantastic! I remembered seeing this sandwich and wanting to try it, but not sure how to get my hands on Harissa. I might have to do some searching! Awww, great job Larry! 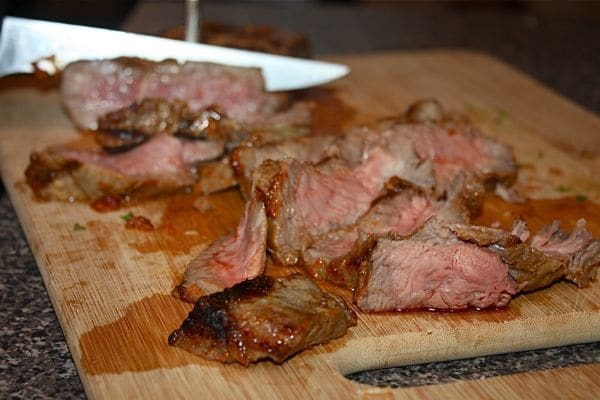 What a tasty steak sandwich! wow that looks great! Good Job Dad! Our daddy noodles is Top Ramen! haha, "that made me very Saad". Awesome job Larry, that sandwich looks incredible. this is FANTASTIC! such a fun blog to read and the sandwich looks out of this world! Man that sammy looks yummy! Great job! Aggie, I’m so glad you posted this link! You absolutely should be proud of him. Larry, it looks awesome! I love that you weren’t afraid to ask for help when you didn’t know how to do something. Learning to cook can be a daunting process, yet at the same time it is exhilarating too! Kudos to you! fabulous! It’s making me hungry! Love this guest post. 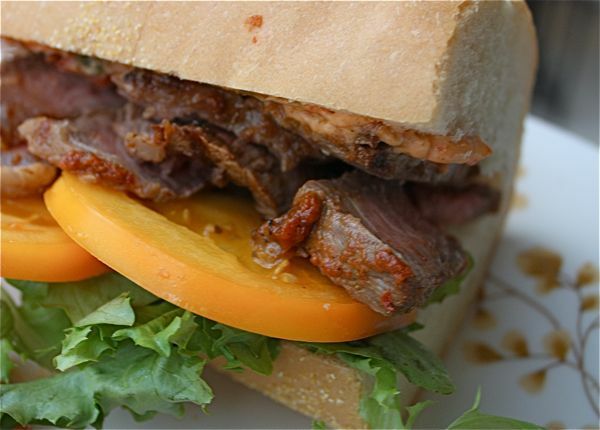 Your steak sandwich looks amazing!! That. Looks. Incredible! Love this post! I need to get my husband to guest post. I’m missing out! I love everything about this recipe, definitely making some of these for dinner tonight! Thanks for sharing!